Almond Oil is extracted from raw almonds. It was already being used by our ancestors as a beauty aid and owes its benefits to the generous amounts of monounsaturated fatty acids, vitamin E, potassium, proteins, zinc, and a number of other vitamins and minerals it contains. Let’s see amazing benefits of Almond Oil for Beautiful Skin and Hair Health. Almond oil comes in two variants; bitter and sweet. Bitter almond oil does have some medicinal properties, and may be pretty safe for external application, but is better avoided due to the high risk of poisoning. Bitter almond oil that may be undertaken with a doctor’s supervision. When the cyanide has been extracted from bitter almond oil, it has antiviral, antibacterial, anti-itch, anti-fungal and antispasmodic properties. The sweet almond oil that comes exclusively from edible almonds selectively cultivated for their sweet taste. It is the oil popularly used for skin and hair care. Almond oil rejuvenates the dark circle area. It brightens the affected area and reduces wrinkles and lines around the eyes. Almond oil is rich in vitamin E and fatty acids. It fights against skin wrinkles, helps to slow down the signs of skin ageing and gives a fresher & younger looking skin. Almond oil moisturizes the skin very well and loosens the dead skins. Excellent remedy for all kind of skin problems. It soothes the irritation of skin and help to cure skin diseases like eczema and psoriasis. Almond oil act as a natural sunscreen and protects the skin from sunburn. It can also reverse sunburn effects and prevents tan on the skin. Almond oil improves blood circulation and tightens dull & aged skin. It also reduces wrinkles and fine lines. Dandruff is the problem that almost everyone has experienced. Some have mild while others have a serious dandruff problem. The main cause of dandruff is the type of skin, be it too oily or too dry. If you have a dandruff problem almond oil is one of the best cures. 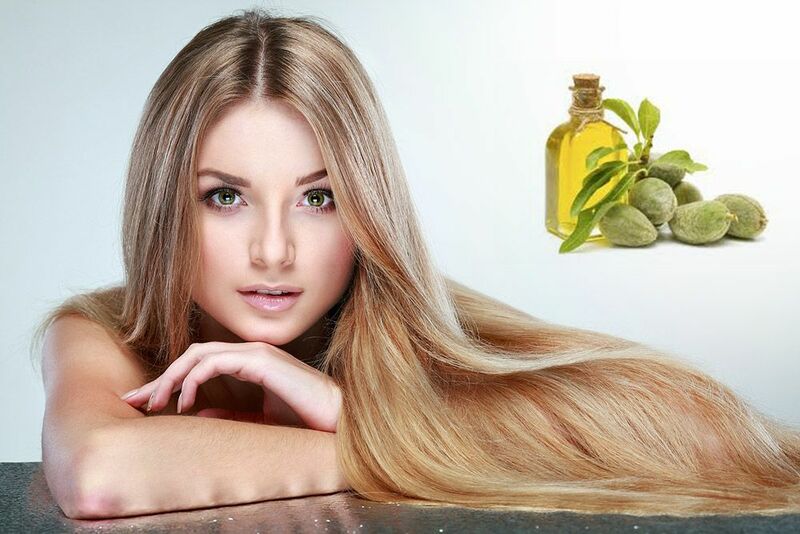 Another advantage of Almond oil for hair is it also helps in preventing split ends to develop. These split ends do not allow hair to grow long. If someone has this split end problem then she should have the proper cut and also the regular use of almond oil will help in rectification of split ends to develop. Another benefit of almond oil for hair is that it is the best product to avoid baldness. Baldness is very common in the men. The major reason for baldness is either weak hair or dandruff. The regular use of almond oil will be the cure for this problem. Almond oil is also a good source for growing the hair, as it contains protein which is the essential requirement for hair growth. If you accompanied the massage of scalp with almond oil then it will help the blood circulation in the head bringing more oxygen to the hair follicle. This will have a great impact on hair growth.